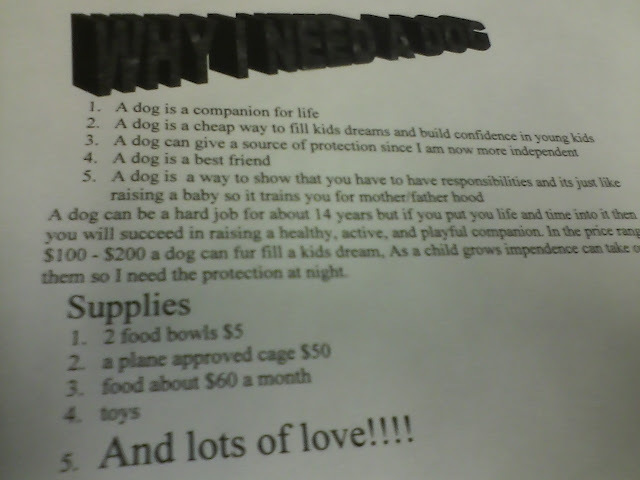 Screwy Decimal: "Why I Need a Dog"
Once upon a time (almost seven years ago), in a land far, far away (Long Island), I worked as a high school English teacher. That particular time in my life was a rather dark one for reasons I won't discuss now, but, long story short, teaching was not the career for me. I found my ultimate bliss in librarianship and everything worked out, but I do sometimes miss the "editorial" aspects of English education. I liked the process of proofreading, correcting, and, to whatever extent I was able, improving a work of writing. I think it’s 90% that I love words, and 10% that I’m a control freak. DON’T JUDGE ME. Anyway, when kids at the library ask me to proofread something for them, I am happy to do so. Although it’s technically not part of my job, I enjoy talking to them about their assignments and what they can maybe change/add/delete to make their essays and reports a bit more polished. It's a satisfying task, because what could be more important than furthering a kid’s education and maybe even helping them to get a higher grade? I’ll tell you what’s more important: helping a kid get a DOG. 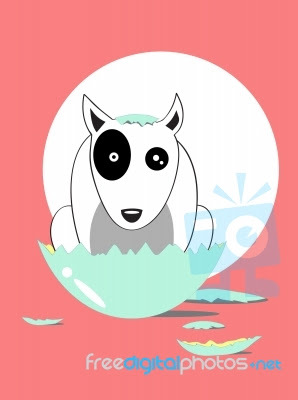 "Puppy Bull Terrier Birth from Egg" is the sort of thing youget when you search for "free dog pictures." Please note her use of "fur fill" instead of "fulfill." Intentional or not, it's PURE GENIUS. I really just love everything about this, and I told the girl so. Sure, there's some awkward sentence structure and a few spelling errors, but, hey, I'm not an English teacher anymore. As far as I'm concerned, she completed her task. A+, kid. I hope you get your dog. Ha! Sounds like a conspiracy! This is beautiful. Pretty sure if I gave this to my spouse he'd be totally cool with another puppy. Right? Yes, definitely. I wish a dog was a cheap companion. I guess it would be for the kid not buying the supplies & dealing with the vet bills. BUT all that being said, I was totally convinced to get her a dog! That is so adorable. I begged my parents for years to get me a dog. I finally got one when I was independent... and 22. Best present to myself EVER. I hope this girl is more successful. Wow, that kid is a planning MACHINE. I'm an adult and I wouldn't think to wonder what a can of dog food cost before I bought one. She definitely deserves a dog. I think that she really deserves to get a dog. I love dogs, and I actually have 3 dogs. 2 of them are shih tzu while the other one is Schnauzer. I love all of them. No more, no less. I always pamper them with the products from Pet Supplies Chicago. I am planning to get another Schnauzer or Siberian husky. However, the latter grows big, and I don't think I can still manage to take care all of them.